In some classrooms there are Combo units that play both DVD and VHS tapes. The buttons on the front of the console are used to Power on the device, Play, Pause, Stop, Rewind, Fast-Forward, and Eject the VHS tape or the DVD. There are RCA (Yellow, White, Red) connections in the font to connect a camera or other device to play media that is not on VHS or DVD through the console. This device does NOT play Blu-ray discs. Only Blu-Ray players can play both DVD's and Blu-Ray Discs. 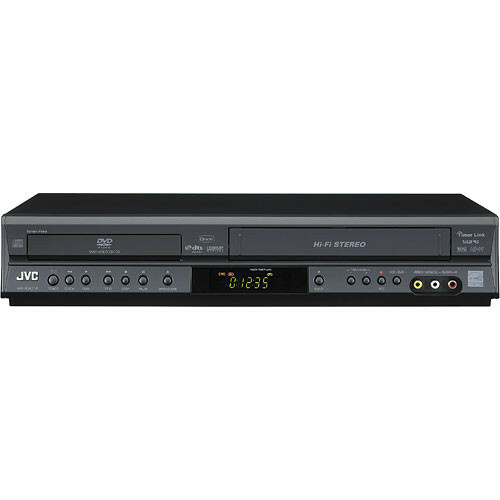 (For more information on Blu-Ray players, please click here). This device will play audio CDs and mp3 files on a data CD or data DVD. This device will allow you to browse jpeg picture files on a data CD or DVD. The remote functions much like the front panel of the console does, but also features Skip buttons for the DVD functionality, a Disc Menu button, as well as subtitle functionality when available.